Susan Puelz was born in 1942 and received her BFA and MFA from the University of Nebraska at Lincoln. In 1987 she became visiting assistant professor of art history and watercolor at UNL and remains in Lincoln to this day. Puelz is known for the vibrant coloration she creates in her watercolor layered pastels. 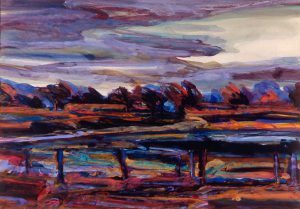 She describes herself as a landscape painter with German Expressionist tendencies and said this about her work, “Painting the landscape as it is does not ever enter my mind. I really try to have an ambiguous quality in my work. Is it abstract or is it a realistic representation?” Puelz leaves that question open for the viewer to answer. My wish is that you could see my work in person. Slides, even photographed professionally, do not capture the effects of layered pastel and watercolor that are important to the totality of my paintings. Upon first glance, I want to see a painting that is based upon landforms, skys, rivers, and other recognizable outdoor images and yet has a sense of place. Looking closer I want you to see the many small abstractions that are created by the mixing of pastel and paint. I want you to see how the margins of a body of water appear to shift depening on how the pastel line disappears into the watercolor. Throughout my work ambiguity prevails. A stand of trees in the background may be painted bright red and yet receed. A lavender-pink curve in the foreground might appear to be a road when in fact it is a small stream. The subject may seem to be found in the midwest when in reality it is dervied from photos taken in Arizona. I like to create a tentative equilibrium between nature and man by using some allusion to human activity. At times referelevator in the foreground, and at other times human presence is alluded to in the faint jog of a line at the horizon that creates a city’s skyline. While landscape is the subject of my paintings, color is the focus. On a recent road trip to Colorado the sun was at my back. It was late September, the winter wheat was just coming up and the milo was that beautiful color between carmine and aubergine. The background of the sky was a soft robing-egg blue and the clouds lavender and gray with melon colored edges. The colors in this morning scene took my work I use combinations of colors that both exaggerate and document nature. My paintings are also about pushing the limits of watercolor and its interaction with the paper and with pastel. I have painted in most mediums and find watercolor the most difficult to master. In every painting there are new suprises. The subtle colors created by the multiple layers of paint, the bright stroke of pastel over equally bright layers of watercolor, or the melting of a pastel line into a layered watercolor stroke are always changing the direction of the painting. Flannery O’Connor wrote to a struggling writer: “ Wouldn’t it be better for you to discover a meaning in what you write than to impose one? Nothing you write will lack meaning because the meaning is in you.” I feel this way every day that I paint. I often see the sense of a particular painting after it is completed. Such is the reality of an artist like me who works more intuitively than intellectually.